Christmas is coming, the goose/ nut-roast is getting fat and so of course there will be some form of consultation to be announced just in case you thought you were going to get away with a planning free Christmas. This year it is the call for evidence for the new planning bill which was announced just after the Bill was published on the 4th December. We have already started to go through it all so that we have time to put in well considered written evidence before the deadline on the 2nd February deadline. The lyrics above are intended to be sung gustily to the tune of Jingle Bells The Twelve Days of Christmas. They are particularly appropriate when attending any festive events where you spy a Member of the Scottish Parliament. They can be safely performed under the influence of a number of glasses of your preferred yuletide tipple. On the first day of Christmas we would love to see a Bill that really delivers community empowerment and equality. Unfortunately the Bill fails to introduce mechanisms that will improve the quality and value of public engagement. In fact, alongside the introduction of a watered down version of local place plans,there are several consultation opportunities being removed by the Bill resulting in an overall loss of community engagement opportunities (eg loss of the Main Issues reports, lengthening of the development plans from 5 to 10 years). Fundamentally the Bill also fails to acknowledge the inequalities that people face in planning, this all needs addressed. Communities, like Santa’s elves, end up spending a lot of time working very hard for very little recognition and reward, we think the Bill can change that. On the second day of Christmas we would like to see communities really empowered to make their own place plans. This means starting at the local level, not having local places dictated to by nationally driven priorities. Obviously, you can’t ignore national policy, but we feel that local plans should be part of a conversation with policy guidelines set elsewhere, not a junior partner. Unfortunately, there is very little in the Bill that will enable people to influence national, regional or even local plan policy. We would like local place plans to have a greater status than this Bill grants and become part of the formal development plan. We want Local Place Plans to have regard for, but not be dictated to, by national policy. Additionally, we would like a statutory duty to involve community councils and bodies in NPF and LDP development. Our third day of Christmas is about being heard. It is important that people are not just consulted but properly engaged, their input needs to be meaningful. People need to feel heard and have their concerns recognised and responded to. That doesn’t mean they need to get what they want but it does mean there needs to be a genuine conversation. We can achieve much better quality engagement in local development plans if a new mechanism to involve communities in the gatechecking process is introduced (as was suggested earlier in the review process). It is also important to produce a modified plan after the draft plan has been consulted on, so that people can see where their views have been taken into account. Currently the only means of getting engaged in the LDP is by commenting on a draft plan, this is a huge retrograde step, from having a main issues report, draft and modified plan in the process. With all the emphasis being placed on “frontloading” engagement it is a bit curious that there seems to be less opportunity to get involved early on at the “front end” of the system. It is important during festive periods that things like drink driving are properly enforced, otherwise it spoils everyone’s fun and can cause serious damage. Likewise, with planning conditions. Greater resource and political will is needed to make sure developments comply with planning conditions and agreed environmental limits. Planning conditions make unacceptable developments more acceptable to the public, it is crucial that they are strictly controlled. So, on the fourth day of Christmas we want better enforcement. We want planning authorities to be supported to take action and far greater resources to go to enforcement. The data for enforcement should be measured and monitored at a national as well as local level to make sure adequate resourcing is provided. We support an increase in fines and fees for retrospective applications. 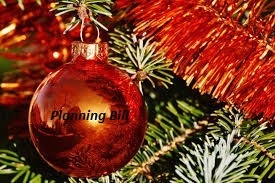 The fifth day of Christmas would be one of public celebration (maybe we would add in an extra public holiday) if politicians took the much needed step towards equality and provided for a right of appeal in this new planning bill. Christmas is a time of giving, so please MSP’s do the right thing and give communities something to rejoice about. We are asking for the bill to include a right of appeal for communities under certain circumstances. In the spirit of Christmas good will we also want the developers right of appeal to be limited to applications that accord with the development plan. We think this would correct a glaring injustice whilst also strengthening the plan-led system. Well after all that celebrating equality, on the sixth day we would certainly sober up if we talked about better regulation. What we would really like to see here is something done to prevent the commonly used developer tactic of putting in repeat applications. There is nothing to stop developers from coming back time and again with slightly altered applications, requiring communities to start all over again with their responses to the planning process. We think that when an application is refused because the principle of development is wrong for a site it should lead to the development plan being automatically modified. This would create a “presumption against” that form of development in that place. We also want the Bill to include a mechanism where there is a presumption against development in cases of repeat applications unless the applicant can prove material changes in the proposal or circumstances. Our seventh day request is simple, we don’t think that cutting back guidance will necessarily make the planning system any simpler for communities. We think the Government needs to show that it values good policy, not prioritise having less of it. Christmas often involves a lot of overindulgence and Strategic Development Zones (SDZ’) look like they might just exacerbate the fat cat housebuilders’ gout. These new zones will have less restrictions than the previous Simplified Planning Zones, making it possible for SDZ’s to be made in conservation areas for example. The process for making and altering these schemes looks worryingly informal, with some centralising mechanisms to refer matters to Scottish Ministers and some aspects very unclear. For example persons (undefined) are to be able to request that schemes are made or require local authorities to review new schemes. If refused the matter can be referred to Scottish Ministers. Altogether these zones suggest a heavy emphasis on promoting development at all costs rather than on planning properly for the long-term health and well-being of people and places. We would ask politicians to consider this section of the Bill very carefully, to ensure that consultation requirements are rigorous including notification requirements for community councils and bodies. Rather than simplified development zones, what we surely need is better development zones? What Christmas wouldn’t be made better without better funds, maybe a bonus or payrise? Planning is hugely under resourced, many planning departments have lost huge numbers of planners resulting in loss of expertise as well as putting huge strain on planners to deliver proper consultation and engagement on a shoestring. And now a huge burden of work and expectation is being placed directly on communities to develop their own local place plans – this looks a lot like the outsourcing of community engagement. It will be a huge ask, particularly of less well organised, dispersed or under resourced communities. The Local Place Plan initiative is set to fail and increase inequalities unless communities themselves (not a bunch of design consultants) are given funds and access to experts to produce their own plans. The icing on the Christmas cake would certainly be greater understanding and buy in to a different way of ‘doing engagement’. Currently communities are consulted more than empowered (or con-insulted as we’ve heard several community members call it). We know that other countries such as Australia have used a wide variety of deliberative engagement techniques to involve people in making decisions on controversial topics. We want to see such techniques used during the NPF and evidence gathering processes for local development plans. The Bill can help to incentivise broader engagement techniques by creating a duty to involve and empower communities in the development of local and national policies. Well, its been a hearty Christmas and the celebrations are coming to an end. But we hope that the ghost of Christmas to come will linger around, asking us difficult questions about how we can improve planning so that it cares for people and place rather than just the residual site value in developers’ ledgers. There may still be an opportunity to explore more proactive and transformative planning powers that could provide a much more effective way of delivering better quality homes and infrastructure. We need a bill that tackles over-inflated land values. This means ending the generous public subsidy given to the development industry whenever they get to keep the increase in land values that we create when granting planning permission. Perhaps we need to wait for a more exciting and forward thinking review in the future, one that comes at the problem from a different perspective. We ask politicians not to overlook Land Value Capture and proactive pubilc land assembly as options. We won’t address the ‘housing crisis’ by granting more planning permissions more quickly. But better planning could ensure that we build homes for fit for many new years to come. So with all that in mind we do hope you have a most excellent Christmas with plenty to be cheerful about. Here is the link to the planning bill and the call for evidence questions. And if anyone is struggling to think of a Christmas present for that person who has everything perhaps you might consider buying them a donation to Planning Democracy! We will happily provide a Christmassy certificate of thanks to anyone making a donation this Christmas*. With a hugely busy year ahead we are needing all the funds we can, especially to get some expert advice on legislative amendments. * digital recordings of the twelve days of Christmas may cost extra, terms and conditions apply.